"WHO Model List of Essential Medicines" (PDF) (16th list (updated) ed.). World Health Organization. March 2010. Retrieved 2010-09-14. ^ a b c d e f g h i Kudo, S; Ishizaki T (December 1999). "Pharmacokinetics of haloperidol: an update". Clinical pharmacokinetics 37 (6): 435–56. ^ "PRODUCT INFORMATION Serenace" (PDF). TGA eBusiness Services. Aspen Pharma Pty Ltd. 29 September 2011. Retrieved 29 May 2014. ^ a b c d e f "Haloperidol". The American Society of Health-System Pharmacists. Retrieved Jan 2, 2015. ^ a b Schuckit, MA (27 November 2014). "Recognition and management of withdrawal delirium (delirium tremens).". The New England journal of medicine 371 (22): 2109–13. ^ "Prescribing medicines in pregnancy database". Australian Government. 3 March 2014. Retrieved Jan 2, 2015. ^ Sneader, Walter (2005). Drug discovery : a history (Rev. and updated ed.). Chichester: Wiley. p. 124. ^ Ravina, Enrique (2011). The evolution of drug discovery : from traditional medicines to modern drugs (1. Aufl. ed.). Weinheim: Wiley-VCH. p. 62. ^ "WHO Model List of Essential Medicines" (PDF). World Health Organization. October 2013. pp. 7, 35. Retrieved 22 April 2014. ^ Stein, edited by George; Wilkinson, Greg (2007). Seminars in general adult psychiatry (2. ed.). London: Gaskell. p. 288. ^ a b Stevens, Andrew (2004). Health care needs assessment : the epidemiologically based needs assessment reviews (2nd ed.). Abingdon: Radcliffe Medical. p. 202. ^ Jeste, Dilip V. (2011). Clinical handbook of schizophrenia (Pbk. ed.). New York: Guilford Press. p. 511. ^ a b c d e f "Haldol Official FDA information, side effects and uses". Drugs.com. Retrieved 2013-10-03. ^ Giannini, A. James; Underwood, Ned A.; Condon, Maggie (2000). "Acute Ketamine Intoxication Treated by Haloperidol". American Journal of Therapeutics 7 (6): 389–91. ^ Giannini, A. James; Eighan, Michael S.; Loiselle, Robert H.; Giannini, Matthew C. (1984). "Comparison of Haloperidol and Chlorpromazine in the Treatment of Phencyclidine Psychosis". The Journal of Clinical Pharmacology 24 (4): 202–4. ^ Joint Formulary Committee (2013). British National Formulary (BNF) (65 ed.). London, UK: Pharmaceutical Press. pp. 229–30. ^ a b Brayfield, A, ed. (13 December 2013). "Haloperidol". Martindale: The Complete Drug Reference. London, UK: Pharmaceutical Press. Retrieved 29 May 2014. ^ Cavanaugh, SV (1986). "Psychiatric emergencies". The Medical clinics of North America 70 (5): 1185–202. ^ Currier, Glenn W. (2003). "The Controversy over 'Chemical Restraint' In Acute Care Psychiatry". Journal of Psychiatric Practice 9 (1): 59–70. ^ Irving, Claire B; Adams, Clive E; Lawrie, Stephen (2006). Irving, Claire B, ed. "Haloperidol versus placebo for schizophrenia". Cochrane Database of Systematic Reviews (4): CD003082. ^ Allen, MH; Currier, GW; Hughes, DH; Reyes-Harde, M; Docherty, JP; Expert Consensus Panel for Behavioral Emergencies (2001). "The Expert Consensus Guideline Series. Treatment of behavioral emergencies". Postgraduate Medicine (Spec No): 1–88; quiz 89–90. ^ Allen, Michael H.; Currier, Glenn W.; Hughes, Douglas H.; Docherty, John P.; Carpenter, Daniel; Ross, Ruth (2003). "Treatment of Behavioral Emergencies: A Summary of the Expert Consensus Guidelines". Journal of Psychiatric Practice 9 (1): 16–38. ^ Allen, Michael H.; Currier, Glenn W.; Carpenter, Daniel; Ross, Ruth W.; Docherty, John P. (2005). "Introduction: Methods, Commentary, and Summary". Journal of Psychiatric Practice 11: 5. ^ Ballard, Clive; Lana, Marisa Margallo; Theodoulou, Megan; Douglas, Simon; McShane, Rupert; Jacoby, Robin; Kossakowski, Katja; Yu, Ly-Mee; Juszczak, Edmund; on behalf of the Investigators DART AD (2008). Brayne, Carol, ed. "A Randomised, Blinded, Placebo-Controlled Trial in Dementia Patients Continuing or Stopping Neuroleptics (The DART-AD Trial)". PLoS Medicine 5 (4): e76. ^ a b Work Group on Schizophrenia. "Practice Guideline for the Treatment of Patients With Schizophrenia Second Edition". Retrieved 21 April 2014. ^ Oosthuizen, P.; Emsley, R. A.; Turner, J.; Keyter, N. (2001). "Determining the optimal dose of haloperidol in first-episode psychosis". Journal of Psychopharmacology 15 (4): 251–5. ^ Tauscher, Johannes; Kapur, Shitij (2001). "Choosing the Right Dose of Antipsychotics in Schizophrenia". CNS Drugs 15 (9): 671–8. ^ Goodman and Gilman's Pharmacological Basis of Therapeutics, 10th edition (McGraw-Hill, 2001). Smith, Thomas J.; Ritter, Joseph K.; Poklis, Justin L.; Fletcher, Devon; Coyne, Patrick J.; Dodson, Patricia; Parker, Gwendolyn (2012). "ABH Gel is Not Absorbed from the Skin of Normal Volunteers". Journal of Pain and Symptom Management 43 (5): 961–6. Weschules, Douglas J. (2005). "Tolerability of the Compound ABHR in Hospice Patients". Journal of Palliative Medicine 8 (6): 1135–43. ^ Truven Health Analytics, Inc. DrugPoint® System (Internet) [cited 2013 Sep 29]. Greenwood Village, CO: Thomsen Healthcare; 2013. ^ Joint Formulary Committee. British National Formulary (BNF) 65. Pharmaceutical Pr; 2013. ^ a b Leucht, Stefan; Cipriani, Andrea; Spineli, Loukia; Mavridis, Dimitris; Örey, Deniz; Richter, Franziska; Samara, Myrto; Barbui, Corrado; Engel, Rolf R; Geddes, John R; Kissling, Werner; Stapf, Marko Paul; Lässig, Bettina; Salanti, Georgia; Davis, John M (2013). "Comparative efficacy and tolerability of 15 antipsychotic drugs in schizophrenia: A multiple-treatments meta-analysis". The Lancet 382 (9896): 951–62. ^ Leentjens, Albert FG; Van Der Mast, Rose C (2005). "Delirium in elderly people: An update". Current Opinion in Psychiatry 18 (3): 325–30. ^ Sandyk, R; Hurwitz, MD (1983). "Toxic irreversible encephalopathy induced by lithium carbonate and haloperidol. A report of 2 cases". South African medical journal 64 (22): 875–6. ^ Bush, S. E.; Hatton, R. C.; Winterstein, A. G.; Thomson, M. R.; Woo, G. W. (2008). "Effects of concomitant amiodarone and haloperidol on Q-Tc interval prolongation". American Journal of Health-System Pharmacy 65 (23): 2232–6. ^ Seeman, P; Tallerico, T (1998). "Antipsychotic drugs which elicit little or no Parkinsonism bind more loosely than dopamine to brain D2 receptors, yet occupy high levels of these receptors". Molecular Psychiatry 3 (2): 123–34. ^ Schotte, A; Janssen PF; Megens AA; Leysen JE (1993). "Occupancy of central neurotransmitter receptors by risperidone, clozapine and haloperidol, measured ex vivo by quantitative autoradiography". Brain Research 631 (2): 191–202. ^ Leysen, JE; Janssen, PM; Gommeren, W; Wynants, J; Pauwels, PJ; Janssen, PA (1992). "In vitro and in vivo receptor binding and effects on monoamine turnover in rat brain regions of the novel antipsychotics risperidone and ocaperidone". Molecular Pharmacology 41 (3): 494–508. ^ Malmberg, Åsa; Mikaels, Åsa; Mohell, Nina (1998). S] Binding"35 Receptor Measured by Guanosine 5′-[γ-Thio]Triphosphate-[3"Agonist and Inverse Agonist Activity at the Dopamine D. The Journal of Pharmacology and Experimental Therapeutics 285 (1): 119–26. ^ Leysen, JE; Janssen, PM; Megens, AA; Schotte, A (1994). "Risperidone: A novel antipsychotic with balanced serotonin-dopamine antagonism, receptor occupancy profile, and pharmacologic activity". The Journal of Clinical Psychiatry 55 (Suppl): 5–12. ^ Cobos, Enrique J.; Del Pozo, Esperanza; Baeyens, José M. (2007). "Irreversible blockade of sigma-1 receptors by haloperidol and its metabolites in guinea pig brain and SH-SY5Y human neuroblastoma cells". Journal of Neurochemistry 102 (3): 812–25. ^ Colabufo, Nicolaantonio; Berardi, Francesco; Contino, Marialessandra; Niso, Mauro; Abate, Carmen; Perrone, Roberto; Tortorella, Vincenzo (2004). "Antiproliferative and cytotoxic effects of some σ2 agonists and σ1 antagonists in tumour cell lines". Naunyn-Schmiedeberg's Archives of Pharmacology 370 (2): 106–13. ^ a b c d e f g h i j k Kroeze, Wesley K; Hufeisen, Sandra J; Popadak, Beth A; Renock, Sean M; Steinberg, Seanna; Ernsberger, Paul; Jayathilake, Karu; Meltzer, Herbert Y; Roth, Bryan L (2003). "H1-Histamine Receptor Affinity Predicts Short-Term Weight Gain for Typical and Atypical Antipsychotic Drugs". Neuropsychopharmacology 28 (3): 519–26. ^ Ilyin, VI; Whittemore, ER; Guastella, J; Weber, E; Woodward, RM (1996). "Subtype-selective inhibition of N-methyl-D-aspartate receptors by haloperidol". Molecular Pharmacology 50 (6): 1541–50. ^ a b Kornhuber, Johannes; Schultz, Andreas; Wiltfang, Jens; Meineke, Ingolf; Gleiter, Christoph H.; Zöchling, Robert; Boissl, Karl-Werner; Leblhuber, Friedrich; Riederer, Peter (1999). "Persistence of Haloperidol in Human Brain Tissue". The American Journal of Psychiatry 156 (6): 885–90. ^ Kornhuber, Johannes; Wiltfang, Jens; Riederer, Peter; Bleich, Stefan (2006). "Neuroleptic drugs in the human brain: Clinical impact of persistence and region-specific distribution". European Archives of Psychiatry and Clinical Neuroscience 256 (5): 274–80. ^ Granger, Bernard; Albu, Simona (2005). "The Haloperidol Story". Annals of Clinical Psychiatry 17 (3): 137–40. ^ Lopez-Munoz, Francisco; Alamo, Cecilio (2009). "The Consolidation of Neuroleptic Therapy: Janssen, the Discovery of Haloperidol and Its Introduction into Clinical Practice". Brain Research Bulletin 79: 130–141. ^ "Veterinary:Avian at Lloyd Center Pharmacy". Haloperidol is also used on many different kinds of animals. It appears to be particularly successful when given to birds, e.g., a parrot that will otherwise continuously pluck its feathers out. It is sold under the tradenames Aloperidin, Bioperidolo, Brotopon, Dozic, Duraperidol (Germany), Einalon S, Eukystol, Haldol (common tradename in the US and UK), Halosten, Keselan, Linton, Peluces, Serenace and Sigaperidol. Haloperidol is the INN, BAN, USAN, AAN approved name. Haloperidol was approved by the U.S. Food and Drug Administration (FDA) on April 12, 1967; it was later marketed in the U.S. and other countries under the brand name Haldol by McNeil Laboratories. Haloperidol was discovered by Paul Janssen. It was developed in 1958 at the Belgian company Janssen Pharmaceutica and submitted to the first of clinical trials in Belgium later that year. Haloperidol is heavily protein bound in human plasma, with a free fraction of only 7.5 to 11.6%. It is also extensively metabolized in the liver with only about 1% of the administered dose excreted unchanged in the urine. The greatest proportion of the hepatic clearance is by glucuronidation, followed by reduction and CYP-mediated oxidation, primarily by CYP3A4. The concentration of haloperidol in brain tissue is about 20-fold higher compared to blood levels. It is slowly eliminated from brain tissue, which may explain the slow disappearance of side effects when the medication is stopped. Plasma levels of four to 25 micrograms per liter are required for therapeutic action. The determination of plasma levels can be used to calculate dose adjustments and to check compliance, particularly in long-term patients. Plasma levels in excess of the therapeutic range may lead to a higher incidence of side effects or even pose the risk of haloperidol intoxication. The bioavailability is 100% in intravenous (IV) injection, and the very rapid onset of action is seen within seconds. The T1/2 is 14.1 to 26.2 hours. The apparent volume of distribution is between 9.5 to 21.7 L/kg. The duration of action is four to six hours. 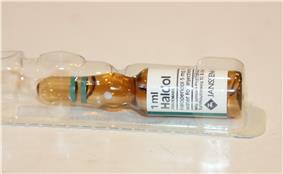 If haloperidol is given as a slow IV infusion, the onset of action is slowed, and the duration of action is prolonged. The drug is well and rapidly absorbed with a high bioavailability when injected intramuscularly. The Tmax is 20 minutes in healthy individuals and 33.8 minutes in patients with schizophrenia. The mean T1/2 is 20.7 hours. The decanoate injectable formulation is for intramuscular administration only and is not intended to be used intravenously. The plasma concentrations of haloperidol decanoate reach a peak at about six days after the injection, falling thereafter, with an approximate half-life of three weeks. The bioavailability of oral haloperidol ranges from 60–70%. However, there is a wide variance in reported mean Tmax and T1/2 in different studies, ranging from 1.7 to 6.1 hours and 14.5 to 36.7 hours respectively. Haloperidol is a typical butyrophenone type antipsychotic that exhibits high affinity dopamine D2 receptor antagonism and slow receptor dissociation kinetics. It has effects similar to the phenothiazines. The drug binds preferentially to D2 and Alpha 1 receptors at low dose (ED50 = 0.13 and 0.42 mg/kg, respectively), and 5-HT2 receptors at a higher dose (ED50 = 2.6 mg/kg). Given that antagonism of D2 receptors is more beneficial on the positive symptoms of schizophrenia and 5-HT2 receptors on the negative symptoms, this characteristic underlies haloperidol's greater effect on delusions, hallucinations and other manifestations of psychosis. Haloperidol's negligible affinity for histamine H1 receptors and muscarinic M1 acetylcholine receptors yields an antipsychotic with a lower incidence of sedation, weight gain, and orthostatic hypotension though having higher rates of treatment emergent extrapyramidal symptoms. In general, the prognosis of overdose is good, and lasting damage is not known, provided the person has survived the initial phase. An overdose of haloperidol can be fatal. Treatment is merely symptomatic and involves intensive care with stabilization of vital functions. In early detected cases of oral overdose, induction of emesis, gastric lavage, and the use of activated charcoal can all be tried. Epinephrine is avoided for treatment of hypotension and shock, because its action might be reversed. In the case of a severe overdose, antidotes such as bromocryptine or ropinirole may be used to treat the extrapyramidal effects caused by haloperidol, acting as dopamine receptor agonists. ECG and vital signs should be monitored especially for QT prolongation and severe arrhythmias should be treated with antiarrhythmic measures. Severe extrapyramidal side effects with muscle rigidity and tremors, akathisia, etc. Experimental evidence from animal studies indicates the doses needed for acute poisoning are quite high in relation to therapeutic doses. Overdoses with depot injections are uncommon, because only certified personnel are legally permitted to administer them to patients. Other central depressants (alcohol, tranquilizers, narcotics): actions and side effects of these drugs (sedation, respiratory depression) are increased. In particular, the doses of concomitantly used opioids for chronic pain can be reduced by 50%. Lithium: rare cases of the following symptoms have been noted: encephalopathy, early and late extrapyramidal side effects, other neurologic symptoms, and coma. Amiodarone: Q-Tc interval prolongation (potentially dangerous change in heart rhythm). In patients with hyperthyreosis, the action of haloperidol is intensified and side effects are more likely. Patients with a history of leukopenia: a complete blood count should be monitored frequently during the first few months of therapy and discontinuation of the drug should be considered at the first sign of a clinically significant decline in white blood cells. Elderly patients with dementia-related psychosis: analysis of 17 trials showed the risk of death in this group of patients was 1.6 to 1.7 times that of placebo-treated patients. Most of the causes of death were either cardiovascular or infectious in nature. It is not clear to what extent this observation is attributed to antipsychotic drugs rather than the characteristics of the patients. The drug bears a boxed warning about this risk. Topical formulations of haloperidol should not be used as treatment for nausea because research does not indicate this therapy is more effective than alternatives. The decanoate ester of haloperidol (haloperidol decanoate, trade names Haldol decanoate, Halomonth, Neoperidole) has a much longer duration of action, so is often used in people known to be noncompliant with oral medication. A dose is given by intramuscular injection once every two to four weeks. The IUPAC name of haloperidol decanoate is 4-(4-chlorophenyl)-1-1[4-(4-fluorophenyl)-4-oxobutyl]-4 piperidinyl decanoate. Depot forms are also available; these are injected deeply intramuscularly at regular intervals. The depot forms are not suitable for initial treatment, but are suitable for patients who have demonstrated inconsistency with oral dosages. Other forms of therapy (psychotherapy, occupational therapy/ergotherapy, or social rehabilitation) should be instituted properly. PET imaging studies have suggested low doses are preferable. Clinical response was associated with at least 65% occupancy of D2 receptors, while greater than 72% was likely to cause hyperprolactinaemia and over 78% associated with extrapyramidal side effects. Doses of haloperidol greater than 5 mg increased the risk of side effects without improving efficacy. Patients responded with doses under even 2 mg in first-episode psychosis. For maintenance treatment of schizophrenia, an international consensus conference recommended a reduction dosage by about 20% every 6 months until a minimal maintenance dose is established. During long-term treatment of chronic psychiatric disorders, the daily dose should be reduced to the lowest level needed for maintenance of remission. Sometimes, it may be indicated to terminate haloperidol treatment gradually. In addition, during long-term use, routine monitoring including measurement of BMI, blood pressure, fasting blood sugar, and lipids, is recommended due to the risk of side effects. Skeletal formula of haloperidol decanoate: The decanoate group is highlighted in blue. 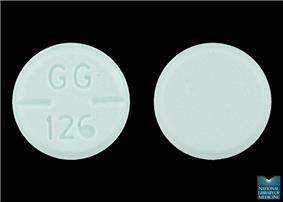 Haloperidol, when given to lactating women, is found in significant amounts in their milk. Breastfed children sometimes show extrapyramidal symptoms. If the use of haloperidol during lactation seems indicated, the benefit for the mother should clearly outweigh the risk for the child, or breastfeeding should be stopped. Data from animal experiments indicate haloperidol is not teratogenic, but is embryotoxic in high doses. In humans, no controlled studies exist. Reports in pregnant women revealed possible damage to the fetus, although most of the women were exposed to multiple drugs during pregnancy. In addition, reports indicate neonates exposed to antipsychotic drugs are at risk for extrapyramidal and/or withdrawal symptoms following delivery, such as agitation, hypertonia, hypotonia, tremor, somnolence, respiratory distress, and feeding disorder. Following accepted general principles, haloperidol should be given during pregnancy only if the benefit to the mother clearly outweighs the potential fetal risk. A multiple-year study suggested this drug and other neuroleptic antipsychotic drugs commonly given to Alzheimer's patients with mild behavioural problems often make their condition worse and its withdrawal was even beneficial for some cognitive and functional measures. Haloperidol was considered indispensable for treating psychiatric emergency situations, although the newer atypical drugs have gained greater role in a number of situations as outlined in a series of consensus reviews published between 2001 and 2005.